Following incidents responders undertake debriefs to identify lessons for the responder community; I’ve participated in and facilitated many such events. However, investigation of past disasters can also reveal information on how they were caused, contributing factors and identify options for prevention or mitigation – essentialy progress is (at least partly) driven by past experience. 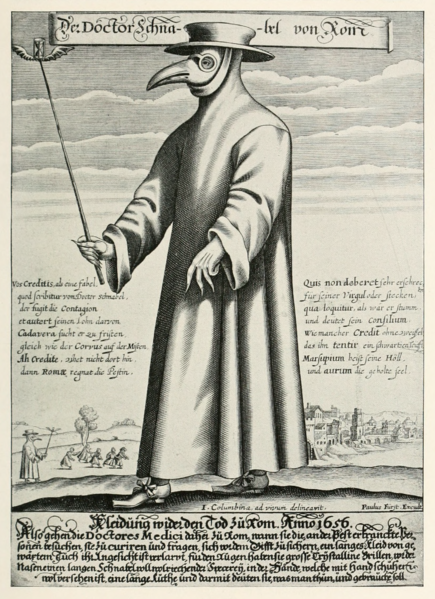 Cries of “make way for the Plague Doctor” were heard from the back of the auditorium as Dr Carole Reeves (UCL), in long coat, beaked mask and hat, made her way to the lectern. 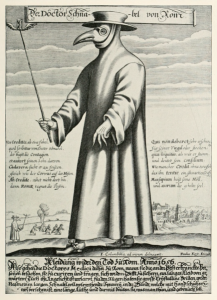 It’s safe to say that not all lectures start as dramatically as the one I attended today, entitled Plague Bones: how London’s Black Death became a tropical disease. The Museum of London (arguably one of my favourites) has amassed quite the collection of bones, sourced from plague pits or during the construction of the London Underground, which are made available to researchers to help analysis of past events, including the Black Death. 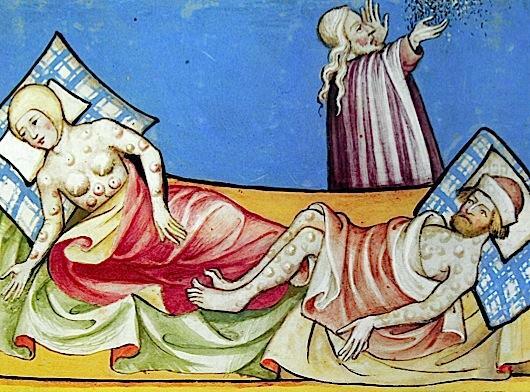 As a term, “Black Death” didn’t arrive until relatively recently in the 19th Century, with “plague” or “pestilence” the terms in 14th Century vogue. As an emerging (or re emerging) infectious disease there was little or no inherent population immunity. It was therefore devastating. At the time, Plague (Yersinia pestis) was seen as a sign of a displeased deity (interestingly, Islamic doctrine at the time was that Plague was the will of God and was to be endured). However, through providing ministry to the dying, the clergy had a higher degree of exposure and was one of the hardest hit populations, with 1 in 3 perishing. Plague doctors, their leather beaks stuffed with herbs and spices to ward off evil airs, were in short supply in the Middle Ages. However, other professions rolled up their sleeves to provide diagnosis and treatment, notably barbers (have you noticed the red and white striped pole outside some barbers – this has it’s roots as an advertisement of the practice of bloodletting). Treatments of the day included purging, cupping, cauterisation and lancing. Some more outrageous suggestions were also suggested including placing a frog on the buboes, rubbing oneself with a chickens bottom, drinking snail tea or chopping up a puppy and applying it, still warm, to the victims chest. No poultry should be eaten, no waterfowl, no pig, no old beef, altogether no fat meat. . . . It is injurious to sleep during the daytime. . . . Fish should not be eaten, too much exercise may be injurious . . . and nothing should be cooked in rainwater. Olive oil with food is deadly. . . . Bathing is dangerous. With such helpful medical advice, it’s no wonder that people turned to religion and ritual; there was a strong reliance on charms and lighting of fires of juniper and rosemary to ward of the mal arias (or bad air, from which we get “malaria”). The significant numbers of fatalities put extreme pressure on burial space, and in London, saw the construction of large emergency cemeteries, the final resting place of some 20,000 victims, some in coffins, but many in burial pits 6 deep. Infections don’t emerge (or re-emerge) in a vacuum, their mutation is linked to climatic and, ecosystem factors, levels of health and immunity and coexisting infections. It’s thought that a contributory factor to the Black Death could have included a series of famines including The Great Famine 1315-1317, movement of military and opening of trade routes between Europe and Asia, and coexisting infections of tuberculosis, lice and intestinal parasites. 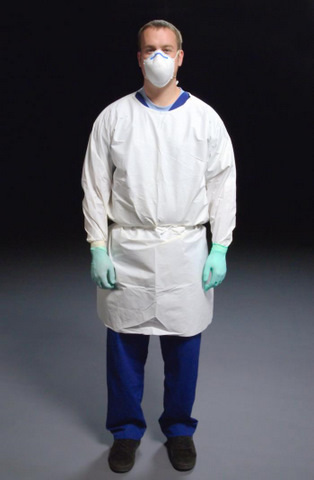 Protection – with advances in materials and understanding, we’re now able to protect ourselves against infections through hand and respiratory hygiene and barriers such as gloves and masks rather than beaked leather masks stuffed with herbs and spices. General Health – again rooted in understanding of disease, the notion of germs and the rise of cleanliness, we now have access to clean water, flushing toilets and it’s difficult to imagine a situation where public health authorities recommend exercise being injurious! Much of this has progress has been the result of learning stemming from past incidents. Whether the Black Death hundreds of years ago, or recent outbreaks of SARS, lessons from the past must continue to shape our preparedness for the future.